Our job doesn't stop once leads have been generated. 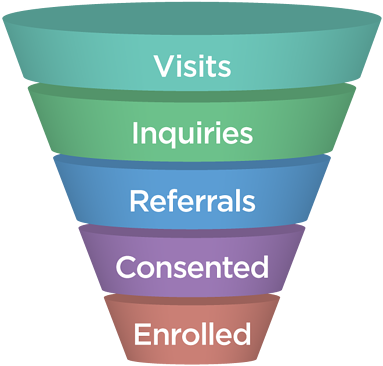 We follow that lead through the funnel to assure they become enrolled. Through years of experience, we've identified one particular area in the patient pipeline that requires immediate attention in most clinical trials: downstream lead management. Once a lead has been qualified, it needs to be followed to randomization or disqualification. We use state-of-the-art tools to track leads and optimize the pipeline, ensuring you turn as many leads into patients as possible. Performance Portal lead tracking & management system – actionable data and insights from your digital campaigns' performance. Includes contact, connection, (pre)screen fail/no-show/consent rates. Site response monitoring technology – keep track of site performance, identify successful sites and those that may require more resources & support. One recent study with restrictive inclusion/exclusion criteria experienced a lead-to-randomizationc conversion rate of 1%. Once downstream lead management tactics were implemented, MD Connect was able to turn 3x as many qualified digital leads into randomized patients. In less competitive indications, MD Connect has seen conversion rates as high as 11.8%.